Quick Pic - One Hummer or Two? 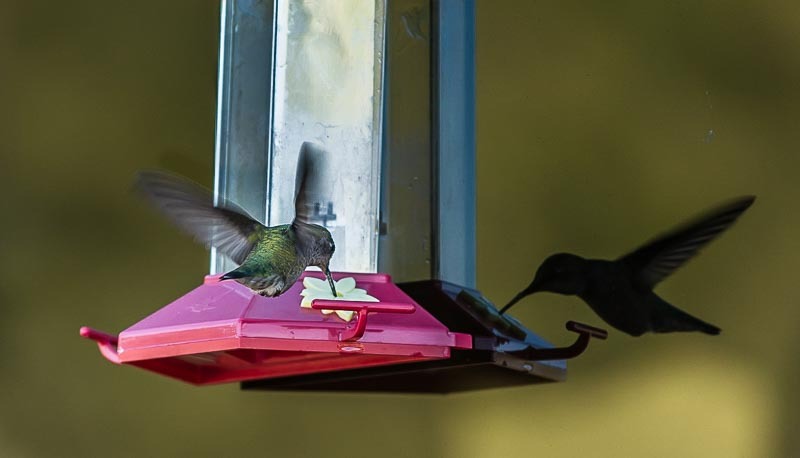 We have been enjoying watching the hummingbirds visiting the feeder on our RV while camped in the outer reaches of Phoenix, Arizona, lately. These little guys are very cheeky and rather bossy for such a diminutive creature — loads of fun to watch! Whenever we’re parked in hummingbird territory, we hang a window-mounted hummingbird feeder on the outside of the window. It’s a clever design with a little suction cup on it that makes it very easy to put on (and get off) an RV’s windows. Best of all, it gives us front row seats for a “dinner-and-a-show” at every meal! Right now, a little male and female have been politely taking turns at the feeder, so one or the other of them has been at the feeder at every hour all day long! Yesterday Mark was outside and got a pic of the female taking a drink while hovering over the feeder. He caught her reflection in our window perfectly, so the photo looks like there are two birds at the feeder. But there is just one! The real bird is on the left and her reflection in our window is on the right! 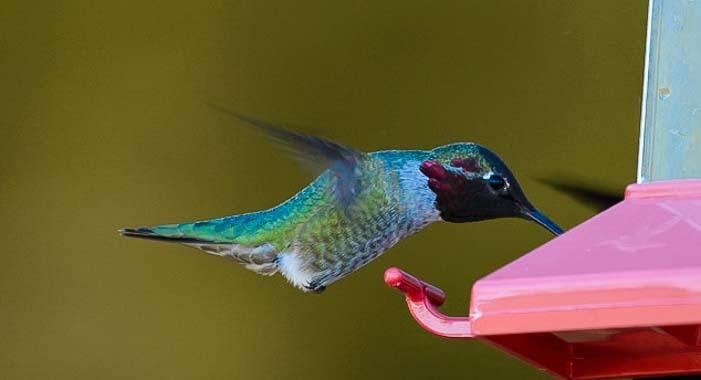 Hummingbirds are about the easiest birds to feed, and they are perfect travel companions for RVers because it takes so little to attract them. They like a super simple formula of one part white sugar to four parts water. And that’s it! No need for fancy hummingbird food. We put a mark on our feeder for how much water to fill it with. We usually start with a little bit of warm water in the bottom so the sugar dissolves. Then we fill it the rest of the way with cooler water so they don’t burn their tongues! For more fun pics of hummingbirds at our window feeder, here’s a post I wrote a while ago about doing “wildlife” photography and shooting hummingbirds from inside our rig: To Catch a Hummingbird. Click this link for our full collection of Quick Pic posts!